The Town of Long Lake Parks, Recreation & Tourism Department announces the 2016 Photography Contest. Amateur photographers are invited to submit a maximum of three entries for the competition. Submissions should be photos from within Long Lake and Raquette Lake. Prizes will be awarded for categories including: Our Town, People at Play, Best Landscape, Best Wildlife and overall Best in Show. Only digital entries will be accepted. Entries must be submitted in jpeg format to longlakephotocontest@gmail.com by April 21st at 5pm with name, address, phone, email, category, location where photo was taken and title, if any and category. Photos can only be submitted as an email attachment and should not exceed 10MB. Maximum of three entries per person. The awards will be announced Friday, May 20th. In 2013 the Town of Long Lake sponsored a competition and forty-two photographers submitted 106 images. In 2013 the Winners were Carolynn McCann of Old Forge, George Cigale of Long Lake and Christopher Dunn of New Windsor NY. All photos become the property of the Town of Long Lake. The Town of Long Lake reserves the right to use any image submitted to the photo contest for publicity purposes including, but not limited to: Facebook, Twitter, Pinterest, Instagram, Google +, Youtube, Flickr, general print advertising, the official town municipal website www.mylonglake.com or www.myraquettelake.com or any other location deemed appropriate for promotional purposes. Winning photos will be featured in the 2017 Long Lake Lions Club Community Calendar. 2016 turned out to be an awesome winter for seven-year old snowboarder Griffin Farr. He took advantage of the varied terrain at slopes all around the Long Lake area. His treks included Jay Peak, Gore, Oak, and Smugglers Notch in Vermont. He was so excited about his excellent winter that he put togehter a highlight reel to show his friends at the Long Lake Central School Talent Show. He’s an insipration and we are thrilled that he shared his mad skills with us in this fun video. Griffin Farr showcases his favorite Long Lake logo on his snowboard. 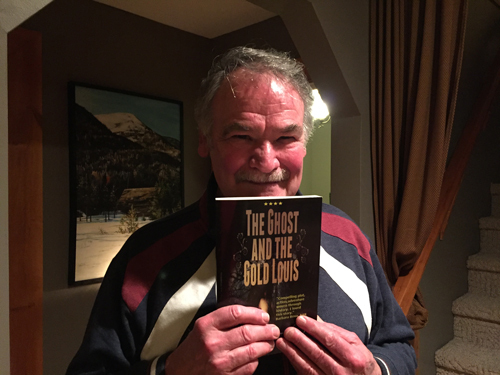 He was just Long Lake’s own Jamie Sutliff, author, well-known Rustic furniture maker, musician, artist, and Renaissance man, and “independent spirit” and now he has won 1st place in a prestigious film festival for one of his books that he adapted into a screenplay. This is a great honor for Jamie who has published several books and now he has the opportunity to travel to Utah to attend the ceremony where he will be recognized for his screenwriting achievement. It is essential for Jamie’s writing career to go to the Utah festival. He will participate in the festival as an honored guest and having opportunities to meet with other film-makers, writers, producers as well as being interviewed on the red carpet to promote his work and success. This is a great opportunity to be up close and personal with members of the film industry and it’s an opportunity of a lifetime for Jamie. Time is short. A group of Jamie’s friends have already raised $1,000 towards the estimated expenses of getting Jamie to Utah for the Festival and the award ceremony and we’d like to ask for your help in raising the rest by March 23th. Not only would this award be great for Jamie, but having an award winning screenwriter in Long Lake would be wonderful for the Adirondack region. Here is a link to the gofundme campaign running only until March 23, 2016. Congrats to this talented Long Laker and we wish him the best of luck in his artistic endeavors and film-making dreams. •	Algonquin and Iroquois from Lake Colden – 18 to 19 miles RT using trails and a herd path for Iroquois. This is not the most popular route to these peaks but if you want a challenge it will give you that. •	Mount Colden – 15 to 16 mile RT using all marked trail. This will gain you one of the most fantastic High Peaks on the list and this trail is a fun one, steep, but fun. •	Mount Cliff and Redfield – a 16+ mile RT day is what it will take for these two peaks by using marked trails and distinct herd paths to both of these summits. You will be challenged and you will love it. This trailhead is one of the more popular approaches to these two peaks. •	Gray Peak, Mount Skylight, and Mount Marcy – These three peaks while easily accessed from this side will require a 20+ miles RT day, and that’s to get just one. If you so desire all three, a day trip would be one for the record books, but done more often that one might think. Consider one night at Uphill Lean to break up the distance and then come back to Long Lake for some great food and drink to celebrate. Fantastic one bed, 1 bath apartment in the center of the Long Lake. We are walking distance to basically everything in town. Completely renovated in 2015, it comfortably sleeps 2 to 4 people with queen bed and sleeper sofa. Brand new full kitchen with granite countertops, Kenmore appliances, Keurig coffee maker. Property maintenance, management, design and installation. Even though Winter has been coming to a close, pretty much since it started, the activites don’t let up in Long Lake. A bubble volcano. Bubble roller coaster. A kid in a bubble? Jeff Boyer takes bubbles to the max in this one-man bubble extravaganza Sunday March 20th, 1pm at the Long Lake Town Hall, 1204 Main Street, Long Lake, NY. It’s the craziest, most creative bubble show around. Jeff juggles bubbles, sculpts and builds with bubbles, makes fog-filled bubbles and more. Mixing comedy, music and interactive bubble-magic, he engages and delights audiences of all ages. A hit at performing arts centers, festivals…anywhere there’s air! Bubble Trouble comes to Long Lake on Sunday, March 20th at 1pm. A great kid friendly event and it’s free! Then on Sunday, April 17th we have the return of the Mud Season Talent Show. We’re hoping Mud Season will actually be over by April 17th, but in case it isn’t this is your invitation to pull your act together. Maybe you’ve written a poem you want to share. Have you edited a short movie starring your entire family and it really needs to be seen by a discerning audience? Well now is your chance! You never know who will see your act at the Long Lake Town Hall. Acts will be given the hook after 8 minutes. So it may not be Warhol’s 15 minutes of fame in in Long Lake, 8 minutes can seem like 15! Please join us! Bring your melodica, your guitar, your laughter, your family and leave the stage fright at home! Sing. Dance. Tell jokes. Play an instrument. Start a band. Slam Poetry. Monologues. You name it, you can do it at the Mud Season Talent Show, April 17th, 1pm at the Town Hall. All ages are welcome to participate and admission will be free. Sign up by calling 518-624-3077 to be guaranteed a spot or show up to the day of!